27-Mar-2005 -- On my way from Atlanta home to suburban Washington, DC, I took a new and different route north through east Tennessee. 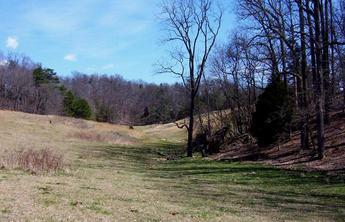 The confluence at 36N 83W is in the hilly country north and east of Smoky Mountain National Park. I chose a slightly different approach than the earlier visitors, continuing east on Long Creek Road to a road labeled Data Way. When I reached the end of Data Way, the confluence was about a quarter of a mile still ahead of me over a forested ridge. On my right was a driveway leading to a house where an elderly man was working on the porch and an elderly lady was visible in back. As I drove up the driveway, the lady came around to see what I wanted. When I asked her permission to walk in the direction of the confluence, she pointed a little farther west and said there was a road and I was welcome to use it. I thanked her and proceeded on a faint road to a metal outbuilding at the top of the ridge. I was now about a third of a mile from the dashpoint, but I was at the top of the ridge and had only open space between me and the confluence. I parked Emma (my Explorer) and continued steeply down to the valley below on foot. I reached the confluence easily and locked in on all zeros (photo #5). My photo #1 to the east is almost identical to the previous visitors’ first photo. Photo #2 shows the wooded ridge south of the confluence and photo #3 is looking west in the direction of my path from the ridge above. Photo #4 is the view to the north. #2: View to the south. #3: I came from the trees in the distance in the west. #4: View to the North.